This Goff guide applies to oil storage tanks up to 3500 litres capacity supplying oil to single family dwellings for heating and cooking purposes. The information here is a general guide, and you should always check with your OFTEC registered technician how the regulations affect you. Modern oil storage tanks come in all shapes and sizes and can be made from plastic or steel. The size and type will depend on the your individual and domestic requirements and the tanks location. Your tank should be manufactured to OFTEC standards (OFS T100 for plastic tanks or OFS T200 for steel). To minimize the risk of pollution from an oil spill, some installations must have secondary containment (a bund). This can be achieved by either choosing an integrally bunded tank or constructing a bund around a tank. The bund must be capable of holding at least 110% of the tanks contents. 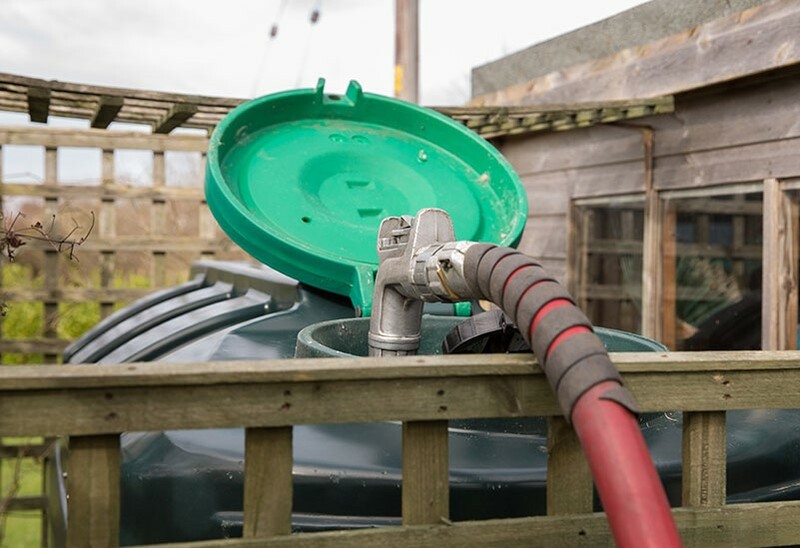 An OFTEC registered technician registered under the ‘Competent Person’ scheme can advise you whether you need a bunded tank using a standard risk assessment . Typically, installations near a river, well or any controlled water will require bunding, along with tanks that use a remote filler point. It is unlikely that a fire could be started by a domestic oil storage tank and its contents. However, tanks are required to comply with fire separation distances in order to adequately protect stored fuel from a fire or heat source, which may originate nearby. • 600mm away from screening (e.g. trellis and foliage) that does not form part of the boundry. If it is impossible to comply with these requirements, then a fire protection barrier with at least 30 minutes fire rating should be provided. A minimum separation distance of 100mm is required between the tank and the fire rated barrier unless a larger distance is specified by the tank manufacturer. In some situations, the oil storage tank can be sited inside a building such as a garage or outhouse. Installations of this type require the tank to be self- contained within a 60 minute fire rated chamber. • Large enough to extend 300mm beyond all sides of the tank. If an oil storage tank is inadequately supported, the tank itself can be weakened leading to the eventual failure and escape of the stored fuel. During the life of an installation an oil storage tank base will need to provide continual structural support, even though ground conditions may alter from season to season and year to year. Oil storage tank installations need to comply with regional building regulations. In England & Wales, OFTEC registered technicians can self-certify their own work without involving local authority building control. But if you choose to use someone who isn’t registered with a ‘Competent Person’ scheme like OFTEC, then you will have to obtain a building control notice and arrange for an inspection which can be costly and time consuming. Similar rules apply in Scotland where you may need to apply for a warrant. It is important that oil storage tanks are inspected annually, preferably by an OFTEC registered technician. Whilst our delivery driver will undertake a pre-delivery assessment the tank; this is principally to see if the receiving tank will safely take the ordered quantity. This is not considered an annual inspection and this process does not certify the tank or installation in any way. This animated video from the Channel Islands about oil tank leak prevention is very informative, as is this Oilcare guide. Hopefully you have found this Goff Heating Oil how to guide useful. If we can help you with any other queries or if you have an idea for a how to guide you would like us to write then please do not hesitate to contact us.